The Eurasian jay (Garrulus glandarius) belongs to the family of jays, magpies and crows, the Corvidae. The Eurasian jay species is distributed in Europe, west, east and central Asia, north Africa and Indian subcontinent. 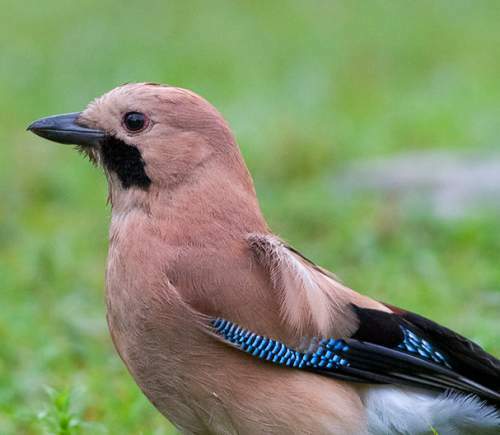 These jay species are well known for their mimicry of other birds. These jays are polytypic species. The Eurasian jay (Garrulus glandarius) is a medium-sized jay, measuring 30 to 35 cm in length and weighing 130 to 200 grams. The wingspan is 50 to 60 cm. The nominate subspecies of Eurasian jay has pale reddish brown plumage. There are black moustache stripes, which extend downward from the base of the bill. There is great variation in plumage among the subspecies. The crest is whitish with black spots. The uppertail is black and the uppertail coverts are whitish. The wings have bright blue and black spots. The bill is stout, pointed and black. The irises are whitish. The legs and feet are brownish gray in color. The call of these Eurasian jay species is a loud, rasping screeching, "shaaak" sound. These Eurasian jay species are distributed in distributed in Europe, west, east and central Asia, north Africa and Indian subcontinent. The Eurasian jay nominate subspecies G. g. glandarius is distributed in north and central Europe. The subspecies G. g. whitakeri, G. g. minor and G. g. cervicalis are distributed in northern Africa. These Eurasian jay species have moderate forest dependence. They normally occur in altitudes from 0 to 2000 meters. The artificial ecosystems and habitats of these species include urban areas and rural gardens. The natural ecosystems and habitats of these Eurasian jay species include tropical and subtropical moist lowland forests, tropical and subtropical moist montane forests, mixed woodlands and temperate forests. The diet of these Eurasian jay species consists mainly of invertebrates. Beetles, caterpillars and insects are their primary food. They also feed on acorns, fruits, berries and seeds. The Eurasian jay species feed both in the trees and on the ground. They glean the insects from the foliage. They are known to feed on eggs and hatchlings of birds and also small rodents. The breeding season of these Eurasian jay species is during April and May in most of their range. These species are monogamous and territorial. The nest is usually built in trees or in large shrubs. The nest is built with sticks, twigs and grass. The clutch contains four to six eggs. Both the parents incubate the eggs. The chicks hatch out after 16 to 20 days and fledge after 20 to 23 days. These Eurasian jay species are non-migratory resident birds. The populations in the higher altitudes descent to lower levels in winter. The global population size of the Eurasian jay (Garrulus glandarius) is estimated to number about 33,000,000 to 65,100,000 mature individual birds. The overall population trend of the species is considered to be stable. In most of its range, this jay species is reported to be generally common to fairly common. The generation length is 7.5 years. Its distribution size is about 43,100,000 sq.km. Habitat alteration and destruction, deforestation, human intrusions and disturbance, sport hunting and capture for pet-trade are the main threats that are endangering the survival of these jay species. 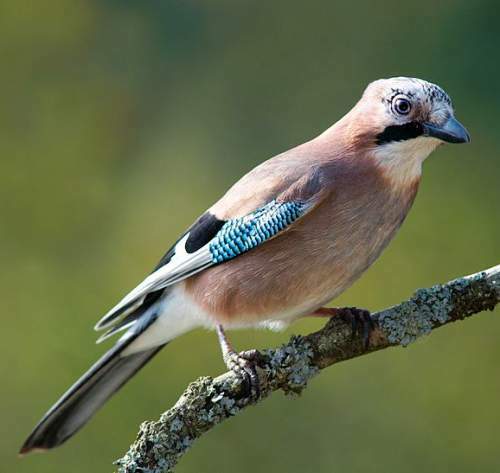 The Eurasian jay (Garrulus glandarius) does not approach the thresholds for being Vulnerable, either under the range size criterion, or under the population trend criterion or under the population size criterion. 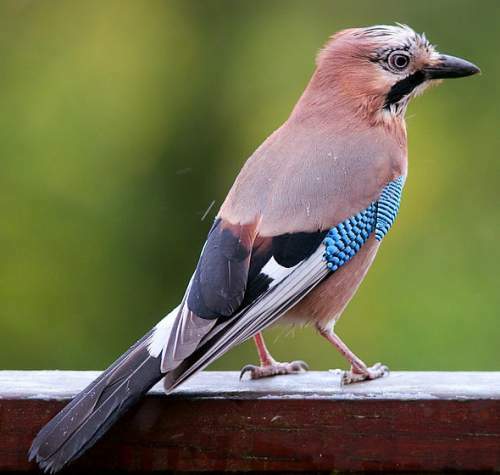 The CITES (Convention on International Trade in Endangered Species of Wild Fauna and Flora) status is ‘Not Evaluated’ for the Eurasian jay (Garrulus glandarius). Twenty-seven subspecies of the Eurasian jay (Garrulus glandarius) are currently recognized. The nominate subspecies G. g. glandarius (Linnaeus, 1758) is also known as European Jay. Current topic in Birds of India: Eurasian jay - Garrulus glandarius.